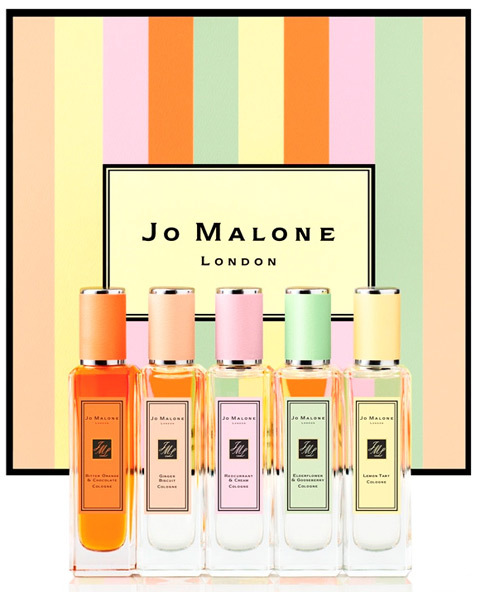 Jo Malone just launched her limited-edition Spring collection of perfumes inspired by British cakes and desserts. The collection is called “Sugar & Spice” and numbers five fragrances in all, each in the super light cologne concentration. According to Basenotes, the perfumer is Christine Nagel of Mane who “spent time with the Jo Malone Creative Studio eating cake in Fortnum and Masons, Claridges and various other fine cake establishments to familiarise herself with the local sweet treats.” The line includes: Redcurrant & Cream, Ginger Biscuit, Lemon Tart, Bitter Orange & Chocolate and Elderflower & Gooseberry. The company has really outdone itself with the campaign for this collection. There is a really fun, bubbly, happy video (see midway down below) featuring Adam Ant’s famous 80s hit, Goody Two Shoes, and also, just in case you missed the food aspects to the collection, the company also released four dessert recipes to accompany the fragrances. (I couldn’t find one for Bitter Orange & Chocolate.) You can find the compiled list of all of them at The Daily Mail, though I will provide the direct link to the appropriate recipe in each fragrance’s discussion section. I have samples of all five colognes, and I’ll review two of them — Ginger Biscuit and Bitter Orange & Chocolate — in this post. You can find my reviews for the other three perfumes in the collection — Elderflower & Gooseberry, Lemon Tart, and Redcurrant & Cream — here. Just-baked biscuit. Spiced with ginger, nutmeg and cinnamon, melting into caramel. Butter-crumbly with roasted hazelnuts. Warmed by tonka bean and vanilla. Irresistible. Notes include ginger, nutmeg and cinnamon, caramel, roasted hazelnuts, tonka bean and vanilla. Ginger Biscuit opens on my skin with a strong note of aldehydes. You can read more about aldehydes and the role they play in perfumery in the Glossary linked at the very top of the page, but, in a nutshell and the simplest terms, aldehydes smell soapy and/or waxy. Here, both aspects are present, though the soap eventually fades after about ten minutes. In those opening minutes, there is also the smell of warm cookies. There are definite and strong notes of vanilla, followed soon thereafter by a light touch hazelnut. 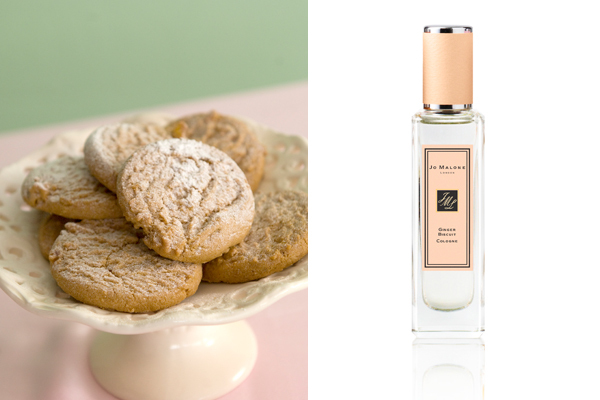 Ginger Biscuit smells essentially just like a cookie or biscuit candle, only about a thousand times milder and lighter. Unfortunately, soon thereafter, something else becomes much more dominant than hazelnut or sweet cookies. There is now a strong note of alcohol — as in rubbing alcohol. Its sharpness makes me think that the “ginger” component is extremely artificial and synthetic. While you can smell ginger, fleetingly, underneath or around it, the note is much more like disinfectant mixed in with vanilla. I’m rather horrified. It feels exactly like you’ve gone to the doctor’s office and the nurse has swabbed your arm before taking blood with some antiseptic, except, here, it happens to be cloaked in cheap vanilla. If this is “ginger,” then you can get much more genuine and natural-smelling ginger in some of the pre-packaged jars in your supermarket. On the barely more positive side, the whole damn perfume is so bloody light and ephemeral, you have to practically douse yourself and wolf at your arm to have much hope of smelling anything detailed. And I’m talking about the very first few minutes here! From a distance of about a foot away, you can smell some extremely generic wafts of vanilla and rubbing alcohol. Further than that, and I wouldn’t count on it for the average spray or two. After the first twenty minutes, the perfume’s low sillage becomes even less. Then, thankfully, shortly before the second hour, the whole thing dies away entirely. It never changed much beyond the main vanilla and alcohol scent I described above, adding a whole new twist on simple, minimalistic and linear. Lest it was not clear from this review, I think this is a horribly cheap-smelling, synthetic fragrance. I find it revolting, and I think even Bath & Body Works has better cookie or vanilla “fragrance sprays.” They cost about $14 for 8 oz which is about 7 more ounces than this stuff. For example, one of their vanilla fragrance sprays is Warm Vanilla Sugar. It doesn’t have “ginger” in it but, if we’re using Ms. Nagel’s definition of “ginger,” that’s just as well. I’ve smelled a lot of ginger in a lot of perfumes, and what’s in Ginger Biscuit does not seem at all like real, genuine-smelling, good ginger but, rather, like something concocted in a lab. Warm Vanilla Sugar is hardly the best vanilla cookie scent I’ve tried but it’s extremely affordable, lacks the screechingly sharp disinfectant note, and is a damn sight better than Ginger Biscuit, in my opinion. Plus, the Bath & Body Works fragrances don’t have a soapy undertone in the opening minutes. I cannot believe Jo Malone is asking $60 for this. And for a miniscule bottle, to boot! Outrageous. Finally, if the perfume isn’t your cup of tea (and I really hope it isn’t), you can always try making the recipe for Stem Ginger Biscuits which can be found at this Daily Mail page. The bite of bitter orange, layered with dark chocolate. 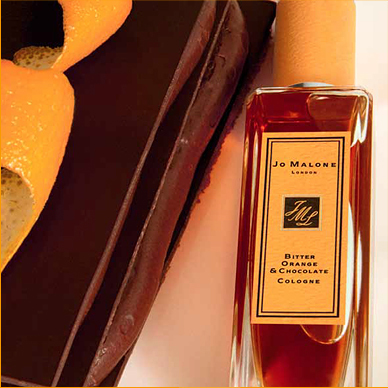 Orange peel counterpoised with warm, powdery cocoa, milky coconut and coumarin. Sumptuous and addictive. [this fragrance is] very special and unexpected. Orange is a classic raw material for a perfumer so we chose to shake things up with a mix of bitter and sweet orange notes. When combined with the chocolate many interesting qualities began to develop. The chocolate is dark, powdery and creamy but the orange adds energy and bite. Bitter Orange & Chocolate opens with an absolutely gorgeous note of rich orange peel and the darkest of bitter chocolate. The orange is sweet, heady and reminiscent of the Seville oranges used in marmalade, only more slightly sugared. It is mouth-watering, delicious, and a simply lovely, lovely note! The chocolate is simultaneously like the dark slabs used in baking but, after ten minutes, it’s also like hot chocolate. As time passes, the chocolate note starts to dominate, adding an occasionally dusty cocoa powder appearance to its other two faces. The orange recedes (alas) to the background, popping up in visibility for brief moments here or there, but generally content to let the chocolate take the lead in this dance. I don’t smell any coconut, milky or otherwise. After thirty minutes, there is the vaguest hint of coumarin that starts to pop up. This version of it is sweet and faintly hay-like, but also with vanilla undertones. The coumarin is very subtle, yet it adds an interesting subtext of dryness to counter the sweet overtones. In its final stage, the perfume turns into a sheer veil of powdered chocolate with some coumarin. The whole thing is very light, sheer and subtle, with minimal projection. You can detect definite whiffs of it in the opening minutes from about half a foot away. Perhaps less. Soon thereafter, you can still smell it if you bring your arm a few inches away from your nose. At the thirty minute mark, you have to put your wrist right under your nose to detect it, and it becomes even more minimal after that. Its duration was much shorter than some of the fragrances in the line: the fragrance died away entirely after about 1.5 hours. All in all, Bitter Orange & Chocolate was my favorite out of the collection. I say that not only because I have an oft-repeated love for orange notes but, also, because this fragrance lacked some of the serious deficiencies of the others in the line. It was neither too, too sweet, nor too artificial and chemical-smelling. There were no notes of sharp disinfectant, soap, or synthetics. It was lovely and well-balanced. It’s not a particularly complicated scent — but, then, it wasn’t trying to be. The problem is that $60 is a lot for a fragrance that is both very simple and of very short duration. Bitter Orange & Chocolate lasted around 1.5 hours on me, and was barely detectable for much of that time unless I jammed my arm under my nose. Some people don’t mind re-application of their scents, but a 90-minute benchmark requires a lot of re-spraying! Even if someone has skin that doesn’t go through perfume as quickly as mine, Jo Malone fragrances are NOT known for their longevity as a whole. So, when your $60 bottle is a tiny 1 oz., those constant re-applications will finish things off quickly and makes the perfume a bit more costly than it might otherwise appear. I read somewhere that Jo Malone representatives suggest layering some of these scents with others from her Tea Fragrance Blends collection. That’s fine, and should help in adding some minor modicum of complexity or depth to some of the scents. The problem is, that Tea collection was from 2011 and is no longer available. But even if it were, or even if you used the current Earl Grey & Cucumber fragrance (which is all that remains available from that collection), perfumes can and should be judged on their own merits. They should not be assessed based on how they smell by buying another $60 bottle to help things along. Besides, I highly doubt that layering would significantly change the duration problem. Like all the fragrances in the collection, Bitter Orange & Chocolate doesn’t suit my personal style or taste, but it is definitely the one I would recommend the most out of the five. You can find my reviews for the other three fragrances in the collection here. Cost & Availability: Each of the colognes in the range costs $60. There is only one size: a very tiny 30 ml/1 fl. oz. As noted earlier, the set is a limited-edition release, but I have no idea how long “limited-edition” means in the Malone world and when they will be removed. Each fragrance can be purchased directly from the Jo Malone website which also offers free shipping “and the fragrance samples of your choice at checkout.” I don’t know how many samples you can get. You can also find the Sugar & Spice Collection at various stores. For example, here is Bitter Orange & Chocolate at Neiman Marcus (with the other perfumes in the series being listed and linked at the bottom of the page). Bergdorf Goodman also carries the full line. Unfortunately, according to a note on their page, neither Bergdorf nor Neiman Marcus ships to Canada. You can also find the collection at Nordstrom. Bloomingdales carries the whole line, along with some sort of Bonus Offer as well. If you want to try out samples, you can find them at Surrender to Chance which is where I purchased my set. That set is currently sold out, but you can purchase samples of each individual fragrance starting at $2.99 for the smallest size (1/2 a ml vial). I highly recommend that you sign up for Surrender to Chance’s email and newsletter as they send out their monthly discount codes. If you’re interested in trying out the Malone fragrances (or any perfumes from StC, for that matter), here are the codes for March: 5% off orders with the code: nomoresnow. However, orders over $75 can get 8% off with the code: wewantspring. Shipping for all orders of any size within the US is $2.95. Due to the massive increase in international shipping rates by the US Postal Service, international shipping has gone up everywhere. At Surrender to Chance, it is — alas — now $12.95 for all orders under $150. 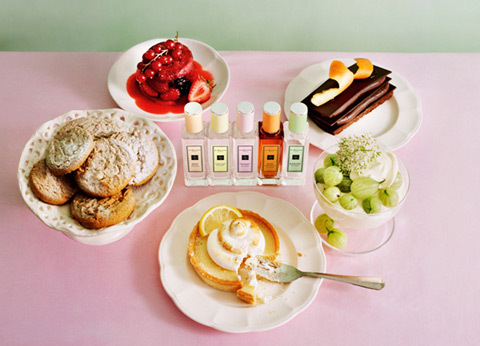 Jo Malone just launched her limited-edition Spring collection of perfumes inspired by British cakes and desserts. The collection is called “Sugar & Spice” and numbers five fragrances in all, each in cologne concentration. The company has really outdone itself with the campaign for this collection. There is a really fun, bubbly, happy video (see midway down below) featuring Adam Ant’s famous 80s hit, Goody Two Shoes, and also, just in case you missed the food aspects to the collection, the company also released dessert recipes to accompany four of the fragrances. (I couldn’t find one for Bitter Orange & Chocolate.) You can find the compiled list of all of the recipes at The Daily Mail, though I will provide the direct link to the appropriate recipe in each fragrance’s discussion section. I have samples of all five colognes, and I’ll review three of them — Elderflower & Gooseberry, Lemon Tart, and Redcurrant & Cream — in this post. You can find my review of Ginger Biscuit and Bitter Orange & Chocolate here. The perfume smells exactly as described: redcurrants, strawberries, and raspberries with a gentle touch of light musk. It opens with a definite flash of red, as the fruits gently swirl in a gauzy, sheer veil above the skin. It’s sweet but, in the first ten minutes, it also has a minimal, extremely light flash of tartness that ensures it’s not pure saccharine in a bottle. The fact that it’s gossamer light also helps. Source: Jo Malone via the Daily Mail. However, that faintly tart edge vanishes after the first thirty minutes, leaving a scent that seems to become even sweeter. By the end, it verges a bit on the cloying side to my nose. I definitely feel as though I’m wearing Strawberries and Cream sponge cake on my arm with a delicate touch of raspberries and a hint of a redcurrant purée. The sillage on the perfume is very low. In the first hour, you can detect it from half a foot away. Maybe. At best. After that, it becomes even closer to the skin. Its lack of projection is a problem for me, but I have no doubt it will make the scent perfect for those who are normally fragrance-averse. The longevity is equally minimal since it is a cologne and, as such, the very lightest possible version of a fragrance. On my perfume-eating skin, it lasted just a little over 1.5 hours on me. It’s not a hugely complex scent — but it’s not trying to be. 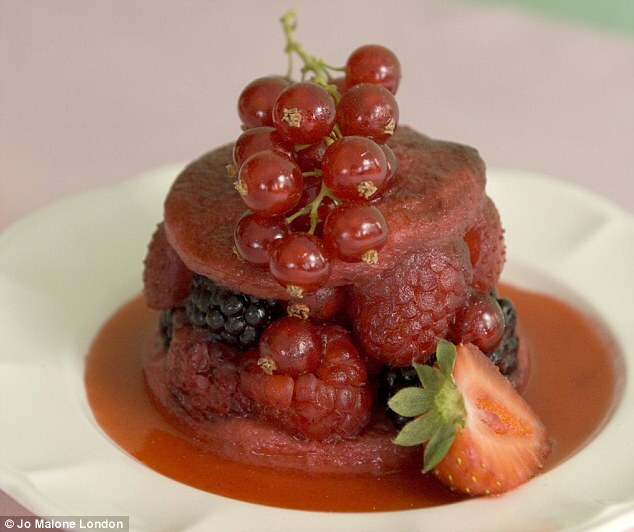 I happen to adore redcurrants, so I think it’s an attractive take on a gourmand fragrance. That said, it’s very sweet. Neither dessert scents nor things with minimal duration are my personal style, so I would never wear Redcurrants & Cream, but I have no doubt it will be a very popular fragrance. The specific recipe launched with this fragrance can be found at this Daily Mail page. A voluptuous gooseberry fool. Crushed, summer-green gooseberries, juicy with lychee, enfolded into the soft delicacy of elderflower. Tender and feminine. I’ve never personally smelled an elderflower, so I have no idea how accurate the fragrance is, but Elderflower & Gooseberry opens on me with delicate, soapy floral notes. The colour hue before my eyes is spring green and lavender. It’s definitely “tender and feminine,” with a soft, gauzy, sheer feel. It’s sweet and, unlike Redcurrants & Cream, never has even a faint tartness. The soapy aldehydes dominate the opening hour of the scent, leaving the strong impression of expensive floral soap. To be honest, I don’t like aldehydes, but I can tolerate them if done well. I don’t think this is done well. The real problem is that something in this scent kept making me want to cough. It hurt and irritated the back of my throat, too, which has never happened to me. Usually, the only bad reaction I have had to fragrances is an extreme tightness at the top of my nose and a headache — sure signs of a fragrance with very synthetic ingredients. But this insistent, incredible irritation and scratchiness in my throat is a new one, and much worse. Given that Nagel says she had to invent the scent of the two main notes, I have no doubt she used some artificial concoction in a lab. This does not smell rich, luxurious or particularly natural. My personal opinion is that $60 is too high for a floral soap scent such as this, but the synthetic aspect to it strengthens that opinion. As time passes, the perfume changes a little bit, but not by much. There is something that evokes lily-of-the-valley in my mind, with perhaps a touch of iris. There is also a very slight powdery feel underlying the notes. The sweetness lessens and the scent feels much more Spring-like. 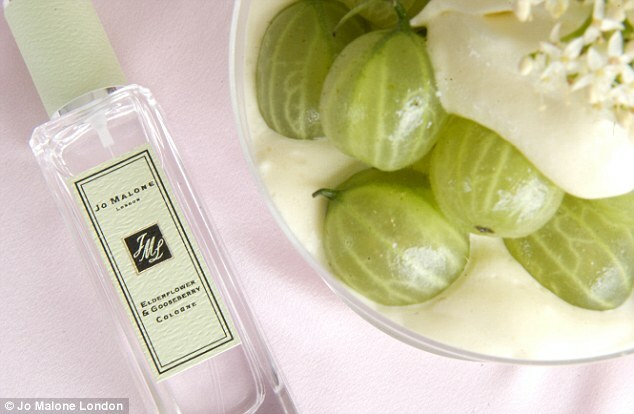 Elderflower & Gooseberry is not a gourmand fragrance in my opinion, though it can be quite sweet at the start. It is much more a light Spring floral that starts with soap and ends up as a floral powder. In its final drydown, it has somewhat of a baby powder aspect to it. The projection and longevity are much like Redcurrants & Cream, though I think Elderflower & Gooseberry is a tad stronger and not as sheer. Elderflower lasted a little over 2 hours on me. I’m not a fan of any part of it, least of all the increased scratchiness and irritation in my throat which remained long after the scent died out. The mouth-watering tang of lemon tart sparking with citrus fruits and verbena, contrasted with swirls of meringue and lemon thyme. Refreshing. As time passes, the perfume changes a little. First, the sweetness increases just a tiny bit. There are notes of light vanilla, almost like that in an actual custard, but never as heavy or as rich. The real star of show, however, is the lemon which is perfectly underscored by the lovely verbena undertone. The arrival of the verbena at the ten minute mark is the second change. Verbena is a type of semi-woody, flowering plant that has a very lemony aroma. Here, it adds a slightly floral aspect like that of lemon flowers. When the verbena is combined with the vaguely woody herbaceousness of the thyme, it ensures a perfect balance in the notes. They also serve to make this a much less of a foodie, dessert fragrance than something like Redcurrant & Cream. Unfortunately, as time passes, much of that zesty lemon freshness fades. The soapy notes overtake the zing and brightness. Lemon Tart turns into a predominantly soapy scent with some thyme and a touch of lemon. There is a very light undercurrent of some artificial white musk. It’s light, but to my nose, it’s evident and feels somewhat synthetic. It’s not terrible, especially if you like soap with a whisper of musk underneath, but I much preferred that sparkling, bright, refreshing opening with its definite ZING. Personally, Lemon Tart is the one that I would recommend the most out of the three that I’ve tried thus far, with Bitter Orange & Chocolate being my favorite as a whole. I would not recommend Elderflower & Gooseberry at all. It’s not because of the soapiness nor even because of the baby powder finish. After all, some people like that. No, I wouldn’t recommend it simply because of how synthetic it smells. Plus, if it irritated my throat (when I’m rarely sensitive to perfumes), then I wouldn’t be surprised if it bothered someone much, much more sensitive to fragrance. You can find my review for the other two, remaining fragrances in the collection — Bitter Orange & Chocolate and Ginger Biscuit — here. Cost & Availability: Each of the colognes in the range costs $60. There is only one size: a very small 30 ml/1 fl. oz. As noted earlier, the set is a limited-edition release, but I have no idea how long “limited-edition” means in the Malone world and when they will be removed. Each fragrance can be purchased directly from the Jo Malone website which also offers free shipping “and the fragrance samples of your choice at checkout.” I don’t know how many samples you can get. You can also find the Sugar & Spice Collection at various stores. For example, here is Lemon Tart at Neiman Marcus (with the other perfumes in the series being listed and linked at the bottom of the page). Bergdorf Goodman also carries the full line. Unfortunately, according to a note on their page, neither Bergdorf nor Neiman Marcus ships to Canada. You can also find the collection at Nordstrom. Finally, Bloomingdales carries the whole line, along with some sort of Bonus Offer as well. If you want to try out samples, you can find them at Surrender to Chance which is where I purchased my set. That set is currently sold out, but you can purchase samples of each individual fragrance starting at $2.99 for the smallest size (1/2 a ml vial). I highly recommend that you sign up for Surrender to Chance’s email and newsletter as they send out their monthly discount codes. If you’re interested in trying out the Malone fragrances (or any perfumes from StC, for that matter), here are the codes for March: 5% off orders with the code: nomoresnow. However, orders over $75 can get 8% off with the code: wewantspring. Shipping for all orders of any size within the US is $2.95. Due to the massive increase in international shipping rates by the US Postal Service, international shipping has gone up everywhere. At Surrender to Chance, it is now (alas) $12.95 for all orders under $150.